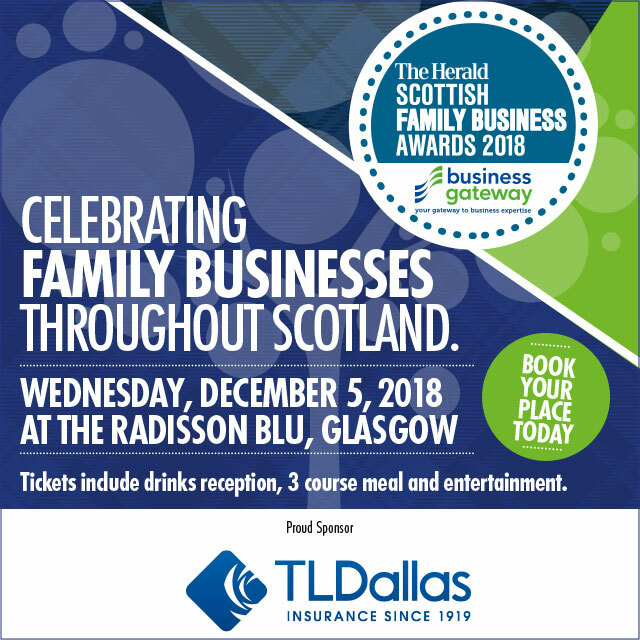 As proud sponsors of the Herald Scottish Family Business Awards 2018, in association with Business Gateway, TL Dallas is delighted to announce that this year’s shortlist of Scottish firms up for awards has now been revealed. Read all about this year’s shortlist here. In its 7th year, the Herald Scottish Family Business Awards 2018 will recognise and reward family businesses of all sizes and all sectors in Scotland at an awards ceremony on Wednesday 5th December 2018 at Radisson Blu Hotel, Glasgow. Celebrating the success of the diverse, dynamic and innovative family business sector, as well as the contribution these firms make to the communities in which they operate and to the wider economy, award categories include Scottish Family Business of the Year, Fastest Growing Family Business Award, Business Innovation Awards and Customer Service Excellence. Previous winners include Campbell & Kennedy, Douglas Laing & Co, Three Sisters Bake, Auchrannie Resort and Laings of Glasgow. For more details about the awards and to book your tickets please visit the event website or contact Nina Holmes, Senior Events Executive on 0141 302 6036 or email nina.holmes@newsquest.co.uk. We've recently made some updates to our Privacy Notice. These updates reflect new data protection laws and provide more clarity regarding how we collect, store and use your data. Click here to review the updated documents.